The rationale for the SEZ is simple. In 2002, Union Commerce Minister Murasoli Maran said India was ‘‘already late” in the export-led growth race and that our restrictive laws might leading to our losing investors to countries like Mauritius or regions like Latin America. So the central government agreed to relax these laws. It had the desired effect, but there were consequences. For one, the panchayats lost some vital administrative powers to the SEZ’s apex body. Secondly, trade uni­ons too saw their bargaining powers compromised. In fact, units set up in the SEZ can simply declare they are following the labour and ind­ustrial laws. No further proof is nee­ded. This is called self-certification. Then, environmental clearances have been speeded up and forests and ecologically fragile areas freed up for SEZs. In a sense then, the Indian Constitution has been suspended in these zones, and a country is being created within a country. The 73rd Amendment gives pan­chayats the right to determine their future — by planning and implementing schemes for economic development and social justice. Passed in 1997, it was hailed as a realisation of Mahatma Gandhi’s dream of Gram Swaraj. It has been the biggest casualty of the SEZ policy by far. The village of Mathur (150 acres) in Tamil Nadu is in mourning. Under a colourful pandal, over blaring loudspeakers, local leaders are organising a Black Pongal. Nearly three-fourths of ten villages in this neighbourhood will be swallowed up by a 2,300-acre SEZ, but none of the panchayat members was consulted. All ten presidents sent their written obj­ections to the collector. Nothing came of it. SEZs cluster around villages because of their low land prices but the Act does not require the participation of the local leaders. “There is no reason to include or not to include panchayat presidents,” says C J Mathews, development commissioner of the Kerala and Mangalore SEZs. The only reason to incl­ude them in any discussion, according to Mathew, is if they have “technical expertise”. In Mangalore, it was peahens that led to a flap. Vidya Dinekar of Citizens Forum called the Indian Institute of Science for a study of the Mangalore SEZ area, because she had spotted them in one of the trips to the area and knew they are listed in Schedule I of the Indian Wildlife Protection Act 1972. “The SEZ will destroy their habitat,” says Vidya. The report from the Centre for Ecological Studies of the IISc recorded “187 species of plants, 59 butterflies, 11 types of dragonfly, six amphibians, three reptiles, 55 birds and seven species of mammals.” Many are protected by law. But the SEZ Act does not prohibit the use of ecologically fragile areas. Its rules merely say that if such land is being used, it must be “indicated by the concerned authorities”. The IISc report states: “Proposed development in the vicinity of the Western Ghats — ecologically sensitive biodiversity hotspot — violates the due recognition given to wildlife and forests in the Constitution of India.’’ The laws, policies and rights being violated includes the Forest Policy 1998, Forest (Conservation) Act 1980, The Biological Diversity Act 2002 and the National Environmental Policy 2006. The report has not stopped the MSEZ. There’s more bad news. Under Section 49 of the SEZ Act, the central government could exempt SEZs from any Central Act (excluding the ones protecting labour rig­hts). 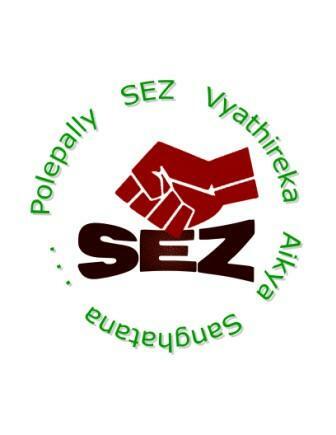 “What if the government decides the Water (Prevention and Control of Pollution) Act and The Air (Prevention and Control of Pollution) Act doesn’t apply to an SEZ with chemical industries?” asks advocate Bala­krishna Pai, who has researched the constitutionality of the SEZ Act. “If the workers took a notion they could stop all speeding trains;/ Every ship upon the ocean they can tie with mighty chains/ Every wheel in the creation, every mine and every mill,” wrote the legendary Joe Hill. The Industrial Disputes Act clearly gives workers the right to strike. Under SEZ rules, state governments have been asked to “endeavour” to delegate the powers of the Labour Commissioner under the Act — the power of negotiation to reach a settlement — to the development commissioner. Labour Court advocate K Balagopal says this will definitely compromise the rights of workers in an SEZ. “The functions of the DC are more geared towards speedy development of the zone and promotion of exports.” So in a (hypothetical) dispute between the worker and the employer, “the DC, anxious to keep the exporter in the SEZ, may push for the employer’s offer, and if the worker is not happy, direct him to the court for appeal.” As this could cause delays, the worker may meekly accept the employer’s offer. Even in Kerala, where the state government publicly announced that labour laws would be protected in the SEZ, union leaders in a profit-making SEZ say that similar situations have already been played out. In the end, we go back to the beginning of our Constitution — the Preamble. It guarantees everyone equality of opportunity. So what of the exporters outside the SEZ? They have no tax sops, they have to battle with irregular water and electricity supply, they have to deal with trade unions, they have the bureaucracy to wrestle with. “We don’t get half an hour of regular water supply in our factory and the units inside the SEZ are being promised 24 hours uninterrupted running water,” says Jeevan, a young exporter in Mangalore. A good article. One sided approach of the author can be viewed only as a narrow outlook on economic development. what about the investment that would flow to the epz, what about the number of employment that would be created. what about the economic development that would take place in and around the economic zones. the revenue to the government by way of taxes that could be used for the development of the state in general and the area in particular?